The first full length volume to approach the premodern Mediterranean from a fully interdisciplinary perspective, this collection defines the Mediterranean as a coherent region with distinct patterns of social, political, and cultural exchange. The essays explore the production, modification, and circulation of identities based on religion, ethnicity, profession, gender, and status as free or slave within three distinctive Mediterranean geographies: islands, entrepôts and empires. Individual essays explore such topics as interreligious conflict and accommodation; immigration and diaspora; polylingualism; classical imitation and canon formation; traffic in sacred objects; Mediterranean slavery; and the dream of a reintegrated Roman empire. Integrating environmental, social, political, religious, literary, artistic, and linguistic concerns, this collection offers a new model for approaching a distinct geographical region as a unique site of cultural and social exchange. 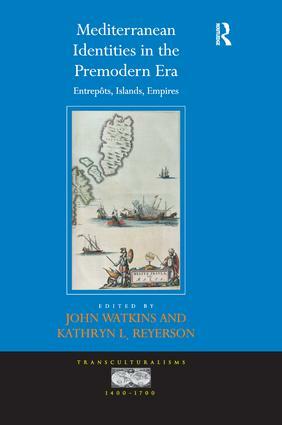 Contents: Mediterranean identities in the premodern era: entrepÃ´ts, islands and empires, John Watkins and Kathryn L. Reyerson. Part I EntrepÃ´ts: The material culture of medieval Venetian identity, David M. Perry; Language and identity in the early modern Mediterranean, Eric R. Dursteler; Hybrid identities: ethnicity, religion, and the Janissaries in 16th-century Constantinople, Cameron W. Bradley; Jonson’s Volpone and the information economy of Anglo-Venetian travel and intelligence, Mark Netzloff. Part II Islands: ’This island of many natural riches and many peoples’: geography, population, and the economic identities of Norman Sicily, Timothy Smit; The role of rhetoric and diplomacy in the creation of Muslim identity in 15th-century Rhodes, Theresa M. Vann; Enchained in paradise: slave identities on the island of Mallorca, ca. 1360-1390, Kevin Mummey. Part III Empires: Identity formation of the bureaucracy of the early Islamic state: ’Abd al-HamÄ«d’s ’letter to the secretaries’, Wadad Kadi (al-QÄá¸Ä«): Charlemagne’s Mediterranean empire, Bernard S. Bachrach; Identities in the Crusader East, James G. Schryver; Tatar-Turkish captivity and conversion in early modern Ukrainian songs, Galina I. Yermolenko; Muslim conversion to Christianity in the early modern period: Arabic texts, European contexts, Nabil Matar; The Game of Canes from the Lusus Troiae to the Albanian Stradioti: defining Moorish and Classical in the early modern Spanish Mediterranean, Javier Irigoyen-GarcÃ­a; Botanical and racial hybridity in the Commentarios reales of el Inca Garcilaso, Ronald E. Surtz. Index. John Watkins is Distinguished McKnight University Professor of at the University of Minnesota, USA. Kathryn L. Reyerson is Professor of History at the University of Minnesota, USA.